The WILE 200 is the best moisture meter in the WILE range for grain and many other materials. The WILE 200 features various settings for all different types of grain, so you will always have the right settings for the grain types in your area. The WILE 200 can be used to measure the moisture content of barley, wheat, rye, oats, rice, maize, peas, red clover, sunflowers, soya, rapeseed and biomass. The Kramp range also includes other models, such as WILE moisture meters for hay or silage in pressed bales, and Kramp offers manual control models as well as sets for fitting on round or square balers. WILE is a brand of Farmcomp, a company based in Tuusula, Finland. The company was founded in 1938 and invented the portable moisture meter for grain during the 1960s. 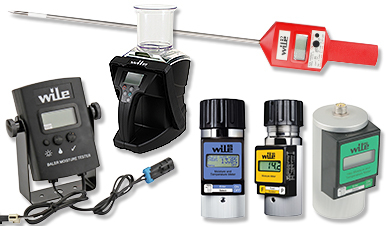 Moisture meters from WILE, one of the company's own brands, have since become global bestsellers in this product category.